Nan Grey was born Eschal Loleet Grey Miller on July 25, 1918 in Houston, Texas. Onn a vacation to Hollywood with her mother, a friend persuaded her to take a screen test. She began a career in motion pictures starting that same year. 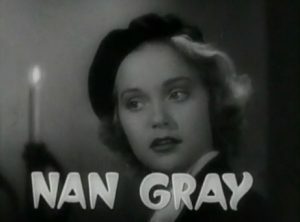 Nan Grey’s most memorable role was in the musical comedy Three Smart Girls (1936) and the sequel, Three Smart Girls Grow Up (1939), but she is best remembered for her roles in the Universal Studios’ horror films as the victim in Dracula’s Daughter (1936), the steadfast girlfriend in The Invisible Man Returns (1940) with Vincent Price, and The House of the Seven Gables (1940) with George Sanders, Margaret Lindsay, and Vincent Price. In her personal life, Nan Grey married the famous jockey Jack Westrope in 1939. They had two girls together (Jan and Pam). Sadly, the marriage ended in divorce in 1950. That same year, Nan remarried to the singer Frankie Laine. He adopted her daughters, and the couple remained married until her death. Nan Grey began dropping out of acting — her last film was in 1941, she left a radio soap opera in 1945, but she made a final appearance on TV’s Rawhide series–where her husband sang the theme song. In the 1960’s Nan experimented with inventions and created a cosmetic compact with a magnifying mirror for nearsighted people–Princess Grace of Monaco was one of her customers. Nan Grey died on her 75th birthday of heart failure in San Diego, California, USA.